There's no excuse for slumming it whilst you take cover under the covers. Take your sleeping aesthetic to a higher echelon with our pick of the most fabulous Aussie linen and sheet suppliers. Behold, the best bed linen doing the rounds of the coolest boudoirs in town. Like the chicest heel and handbag combo, the coolest sheets don't have to match. AURA by Tracie Ellis gets this, and her range of bed linen and rugs remain renegade in their approach – or reproach – of being too matchy/matchy. Committed to forward thinking when it comes to design, AURA ebbs and flows between muted textures and tones and effervescent colour and patterns. Chevrons, stripes and block prints mingle freely with booming jacquards and idiosyncratic hand-made cushions and throws. 'Yes, it's little bit Scandinavian, a little bit Indian, but it's also a whole lot of Melbourne,' Tracie notes. 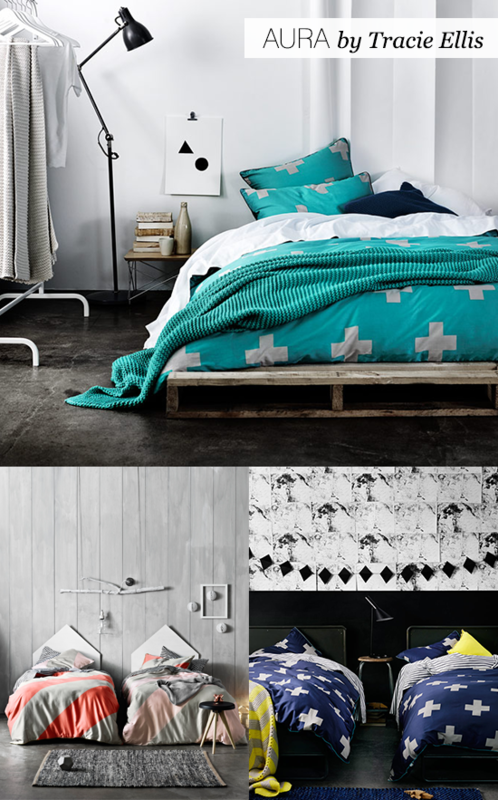 Three Melbourne gals (must be something in the chilly southern air when it comes to designing winning bedding) with a penchant for pops of colour definitely results in a spectacularly superior sleeping experience. Kip & Co say their covetable and comfortable lifestyle brand is inspired by the everyday – which makes you think their everyday is a complete riot. With colourful and quirky doona covers and sheets ripe for expressing your individuality and inner quirk (think pretzels, bananas and leopard prints), these soft furnishings ensure you go to bed, and wake up, in very good form. 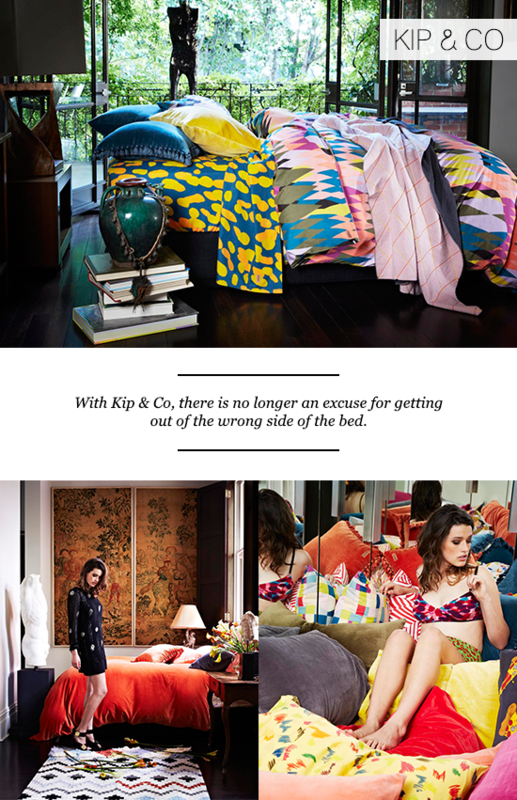 With Kip & Co, there is no longer an excuse for getting out of the wrong side of the bed. It no longer exists. When Lucy Feagins of The Design Files gushes about a design team, you know they must be good. 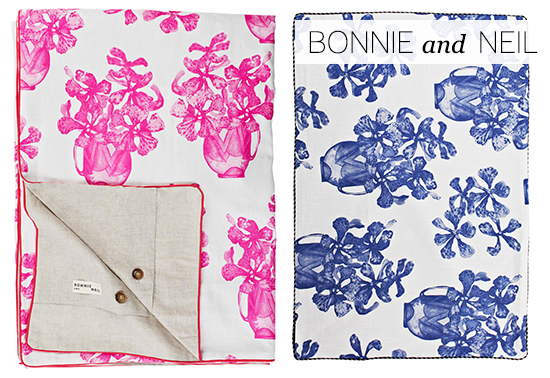 And Bonnie and Neil – one of Australia's most popular independent textile design studios – is ever so good indeed. The Brunswick duo formed their textile brand in 2010 to bring together their collective backgrounds in floristry, art, textiles, furniture and set design. Since then they have produced prodigious seasonal ranges of cushions, bed linen and napery featuring traditional botanical motifs and bright patterns with a heavy lean back to Bonnie's former life as a florist. These eclectic designs are then hand screen-printed using inks mixed at the studio, and can be found stocked in 150 stores both locally and globally. The combined brainchild of Melbourne based sisters Jo Harris and Lucy Glade-Wright, Hunting for George came about in 2010 as an outlet for the girls' passion to create an online experience that bucked the trend of fast, oft-flawed online shopping. 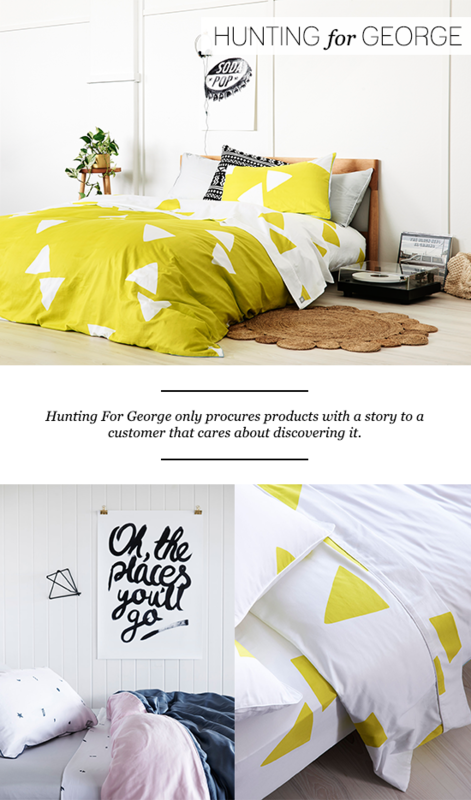 The antithesis of the impersonal internet shopping service, Hunting For George only procures products with a story to a customer that cares about discovering it. All products are handpicked with a focus on an eclectic international and local mix and the girls hold tight to their strong focus of encouraging and forging small business strength. The signature Hunting for George bedding range features unisex hues and patterns, with splashes of colour, ever stylish neutrals and cute little graphic details. 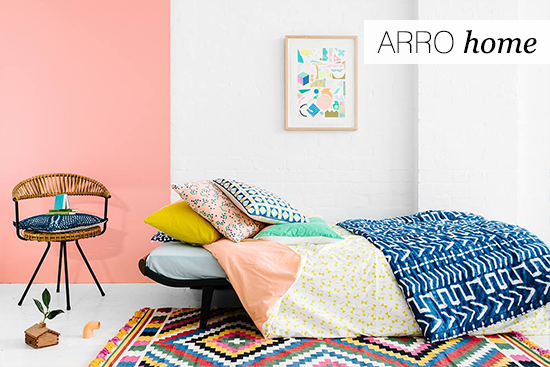 Melbourne designer Beci Orpin's new project – Arro Home – is an extensive new locally-designed homewares label, featuring a diverse range of soft furnishings, rugs, tableware and various quirky, kaleidoscopic pieces to enrich any space. Beci and her small team of assistants have designed the debut range almost exclusively in house with an affordable price point in mind. The inaugural range includes rugs, bedding, cushion and table linen keeping with Beci's distinctive style, successfully smashing all the conservative styling rules of old. Stay tuned for some super cool collaboration in the pipeline and new product categories. Right now, we're loving the quirky Sketchbook doona cover. Image Credits: AURA, Kip & Co, Hunting for George, Arro Home.